Taking measures in the direction of improving power distribution system and addressing consumers' grievances at the same time, the Delhi Electricity Regulatory Commission (DERC) has decided to take a series of steps, including setting of independent laboratories for checking meters and consumer advocacy centres across the city. Delhi has been known as a city of stark contrasts. On the one hand are its affluent residents who live in luxurious houses and travel in big cars while on the other are those who don't even have a roof over their heads. The Delhi Metro Rail Corporation (DMRC) will set up nine new sub-stations and expand the four already existing at the same time in order to support Phase 3 project which will cover another 103 km of the National Capital Region under its map. Light thundershowers were reported from some parts of the city towards the evening today. The showers came after the sky turned cloudy in the later part of the day. The day, meanwhile, was humid. The minimum temperature was registered at 27 degree Celsius, one degree above the normal, and the maximum was recorded at 34.3 degree Celsius, which is also one notch above the normal. The maximum and minimum humidity stood at 84 and 27 per cent, respectively. Three conmen allegedly cheated two persons of more than Rs 3 lakh on the pretext of providing them employment in companies at the domestic airport, the police said today. The incident came to light when Ratheesh Thomas lodged a complaint at the domestic airport police station. A carpenter was arrested for allegedly supplying illegal arms. Six country-made pistols seized from him. The advocacy centres will be opened with the help of the Delhi government to provide legal help to those who want to pursue their complaints against private power distribution companies. It will bring out a handbook to educate the consumers about the electricity sector and their rights. Considering it a consumer-friendly initiative, the DERC has decided to write to the state government in this regard. The most common complaint of consumers against fast running meters will be addressed by recognising National Accreditation Board for Testing and Calibration Laboratories (NABL) accredited laboratories in various areas of the city to check accuracy of the meters, said a DERC official. "The certification by the NABL, which functions under the department of science and technology, is considered prestigious," the official said. In order to reduce power purchase costs, the DERC has also decided to persuade the three power distribution companies in the city to install sophisticated load forecasting techniques to predict possible demand on their network in the course of a day so that power is not wasted. "As part of our effort to modernise the power sector, we have also decided to introduce a new system called time of the metering under which tariff will be charged according to electricity consumption in peak and off-peak hours," said the official. The proposed mechanism aimed at encouraging consumers to limit their power consumption in peak hours is being introduced on a pilot basis, he said. The DERC will also follow up with the discoms for maximising returns from sale of surplus power to bulk consumers in neighbouring states, the officials said. The commission plans to urge the Central Electricity Regulatory Commission to conduct cost audit of central generating stations so that power purchase cost of the distribution companies are properly monitored and kept under control. Power purchase cost comprises 80 to 90 per cent of the cost of providing power at the retail level. The proposed system is being introduced to discourage commercial users from consuming more power during peak hours so that loadshedding could be minimised in residential areas in the peak summer months when the demand goes up substantially, he said. For these homeless people, living on the roadsides or under flyovers or at bus and railway stations, life is a struggle for existence ever day. Adding to their miseries is the weather of the national capital, known for its extreme winters and summers. 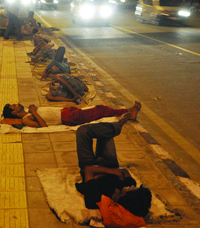 A large number of these Delhi homeless are outsiders with incomplete or no identity documents. The miseries compound when such people die unattended, leaving civic authorities and police with a bizarre problem, disposing of the unidentified dead bodies (UIDB). Seventy-three-year old Bhayalal Tiwari, who hails from Jabalpur, came to Delhi after a fight with his family and never returned. Now, he lives in a homeless shelter run by Aashray Adhikar Abhiyan (AAA), an NGO working for the homeless here. Tiwari admits that many of his friends who live in the shelter have been discarded by their children who never came back looking for them. Similarly, Mohammed Mohin from Bihar has been living at a shelter in Chandni Chowk for the past couple of years. He says that the main reason why people leave their homes is family disputes. "I left mine in 2004 because I had a fight with my elder brother," he said. Director (operations) of AAA Sanjay Kumar points out that the life of homeless people is very tough. ''Most of them are robbed of the petty cash that they earn in a day by street thugs and pickpockets. Some end up as alcoholics and drug addicts just to bear the mindless fatigue of the day-to-day existence and prefer to spend their money on hooch and drugs rather than having it stolen by thieves,'' said Kumar. "The homeless people are individualistic and have a distrustful nature. They are ashamed of their situation. Most of them don't want to go back home and once they come to Delhi, they don't have any contact with their families. After a while their families too stop looking for them," Kumar added. Every year, around 3,000 UIDBs are found in the national capital, according to the statistics of the Zonal Integrated Police Network (zipnet). This is an online database of the police forces of Chandigarh, Delhi, Haryana, Rajasthan, Uttar Pradesh, Uttarakhand and Punjab. As per the zipnet, in 2011, 3,306 UIDBs were found in Delhi. This year, till August 3, 2,109 UIDBs have already been found. According to Deputy Commissioner of Police (North District) Sindhu Pillai, from January 1 to July 8 2012, 446 UIDBs have been found in her area of responsibility. Of these, only 36 could be identified. The additional commissioner of police (New Delhi District) KC Dwivedi admits that in his district, from January 1 to July 9 this year, 71 UIDBs have been found and none could be identified. Additional commissioner of police (Central District) Devesh Chandra Srivastva also confirms that from January 1 to July 11, 198 UIDBs have been recovered in his district, of which only 28 could be identified. The Sabzi Mandi mortuary near the Tis Hazari Court stores the maximum number of bodies. The employees there claim that most number of UIDBs are found during the peak summers in May and June, when many homeless people die of heat stroke. The mortuary is locally known as "cheer-phar". Dr K Goyal, who works at the morgue, said that in a year, about 2,500 post-mortems are conducted there. Employees at the mortuary claim that every day, three to four bodies are brought there from North Delhi alone. During the hottest days, 10 to 15 bodies are brought to the morgue on a daily basis. When a body is found, it is photographed by the police and taken to a mortuary. There, the doctor ascertains if the person died naturally or otherwise, which means whether he was murdered, committed suicide or was a victim of road accident. If the post-mortem reveals that the person was murdered, the police registers a case. Police officials assert that autopsies are usually conducted only if a person has died unnaturally. "To identify a UIDB, the procedure is to compare it with the missing persons' reports posted on zipnet. But this is not of much help, as the body may look 10-15 years older than the actual age due to the hardships endured by a person living on the streets," admits a police official. An IO has to identify a body within 72 hours of its discovery. An enquiry is conducted at the place where the body is found and a wireless message sent to all station house officers and senior superintendents of police across the country. The police also informs the District Missing Persons Unit and the Missing Persons Squad under the Crime Branch. "Hue and Cry" notices with photographs of the deceased are distributed. However, these processes don't often lead to the identification of the body. After all the legal formalities, the unidentified bodies are sent for their last rites. Sanjay, an undertaker at the Sarai Kale Khan crematorium does it. "I have stopped looking at these bodies. It is all part of my daily routine where I cremate at least three to four unidentified corpses every day," says Sanjay, who gives these homeless people some dignity, at least in death. Auxiliary power at 33 KV and traction power at 25 KV will be supplied from these new sub-stations to the Metro stations of the Phase 3 corridor, said DMRC spokesperson Anuj Dayal. The new sub-stations will come at Yamuna Vihar, Vinod Nagar depot, INA, Dhaula Kuan, Mukundpur depot, Kalkaji, RK Puram, Palam and Faridabad. "In addition, four already operational sub-stations of the DMRC will be augmented so that their feeds can be extended to the Phase 3 corridors as well. These operational sub-stations are Jahangirpuri, Subhash Nagar, Botanical Garden and Kashmere Gate," said Dayal. The presently operational 15 sub-stations are at Kashmere Gate, Rithala, Jahangirpuri, New Delhi, Indraprastha, Dwarka, Subhash Nagar, Mundka, Chhattarpur, Sarita Vihar, Botanical Garden, Sushant Lok, Park Street (two sub-stations) and Airport. Presently, power requirements of the Delhi Metro are regulated through 15 sub-stations, which are spread across different parts of the city and NCR. For Phase 3, under which about 140-km lines will be built in the NCR, the approximate power requirement will be 150 MVA by 2016. Light thundershowers were reported from some parts of the city towards the evening today. The showers came after the sky turned cloudy in the later part of the day. The day, meanwhile, was humid. The minimum temperature was registered at 27 degree Celsius, one degree above the normal, and the maximum was recorded at 34.3 degree Celsius, which is also one notch above the normal. 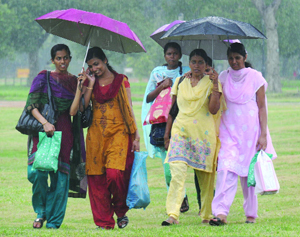 The maximum and minimum humidity stood at 84 and 27 per cent, respectively. The weatherman has forecast light rain for tomorrow as well. "The maximum and minimum temperatures are expected to hover around 34 and 27 degree Celsius, respectively," said an Indian Meteorological MD official. On Saturday, the maximum and minimum temperatures were recorded at 34.3 and 27.5 degree Celsius, respectively. He alleged that his two acquaintances, Byju and Noble, were searching for a job. He sent them to his two contacts, Vikas and Deepak. Vikas and Deepak introduced the two to Ajay Rathi, who took Rs 20,000 each from the victims. Ajay, thereafter, took Rs 1.9 lakh from Noble and Byju and then gave them two fake offer-letters regarding employment in a company with a salary of Rs 15,000 each. But, the company denied that it has given any such offer letters. Ajay, thereafter, told Noble and Byju that he would provide them employment in Indigo and Kingfisher Airlines. He took Rs 1.4 lakh from them, but later they learnt that there was no employment in these companies. DCP BS Jaiswal said that Mohammed Harrun was arrested yesterday from Sector 12, Rohini. He manufactured illegal arms after purchasing raw material and sell them in the price range of Rs 1,500 to Rs 2,500.